My dad, Randy, was one of seven kids and my mom, Heather, was one of four sisters which means we have a lot of family and we grew up with close relationships with most of them. Cousins at a Ringette tournament. Left to right (back) Scott, Jennifer, Lindsey, Katie (front) Ashleigh, Travis. Of all those extended family members, our family was closest (literally and figuratively) to the Russells, Dad's next-in-line sister Gail, her husband Barry (not to be confused with Randy and Gail's brother Barry Leamen) and their 3 kids who age-wise lined up pretty well with us: Jennifer (same age as my sister Lindsey), Scott (year older than me), and Ashleigh (year younger than my brother Travis). We've always done lots of things with the Russells. Many memories and stories from my youth involve their family, their van, March break excursions, scout camps, ringette tournaments, family gatherings, and an especially memorable group trip to the Dominican. 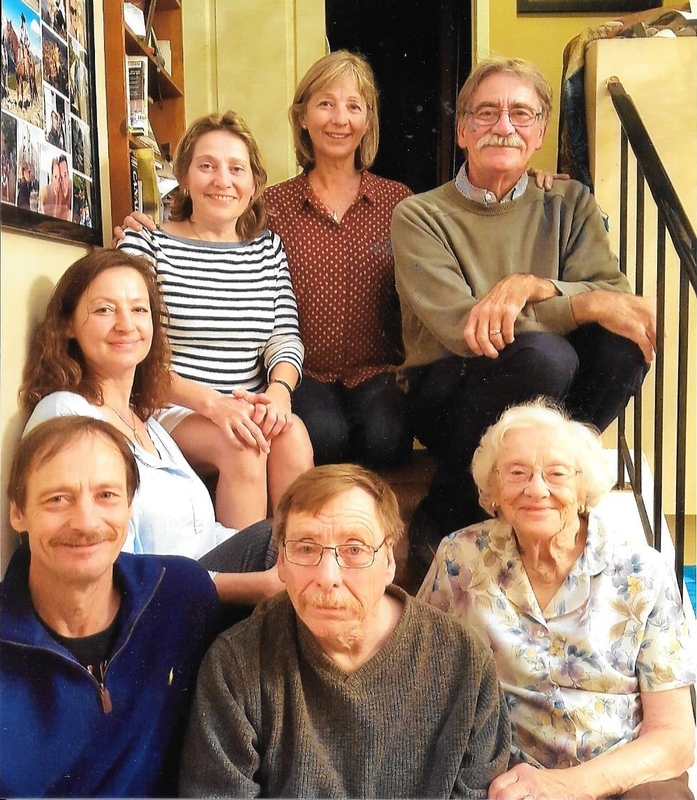 The Leamen siblings with their mom, Thanksgiving 2016: clockwise starting with Randy (mustache), Martha/Grandma, Eddie, Barry L, Lynne, Cheryl, and Gail. Over the last year especially as dialysis became a part of our family's life again triggering old memories and then around Dad's funeral, I started hearing more stories from before my memory of how Dad's kidney health shaped that bond. As much as Dad's kidney disease dramatically impacted his life and our immediate family, the effect was also profound on our extended family. It's an old African proverb that says "It takes a village to raise a child" and this was very true for us. I asked Aunt Gail and Uncle Barry to share some of their memories because this story belongs to them too. We meander topics a bit as that is how reminiscing works, but there is a lot of history covered over these 4 videos. *It should be noted that Gail and Barry have always gone above and beyond to support every member of the Leamen and Russell families and that what they did for our family is just one chapter in a long history of being generous hearts. I am incredibly grateful for them and their willingness to share these memories first with me, and then with you. Katie chats with her Aunt Gail and Uncle Barry Russell (Randy's sister and brother-in-law) about their memories of Randy's diagnosis and subsequent move from the Northwest Territories back to Ontario. In this second segment, Gail and Barry reminisce about life for the whole extended family as Randy's kidney function declined: pulling together, flexibility, cheese, trying to adapt to new routines with kids and work, orange hair and orange fluid, feelings of worth and survivor guilt. Waiting for "The Call" and Gail and Barry's first memory of Randy after his kidney transplant: pagers and pepperoni pizza.